Editors: Dov Pasternak is an agricultural development adviser with decades of experience in the area of dryland agriculture. He worked with the Ben Gurion University of the Negev in Israel from 1971 to 2001, as director of the Institute for Agriculture and Applied Biology. From 2001 to 2011 he worked with ICRISAT-Niger as Principal Scientist in charge of systems and crops diversification. About 98% of agricultural production in the Sudano Sahelian region of West and Central Africa is based on rainfed crops. With a mean annual rainfall of 300 to 800 mm/year, the number of staple crops is very limited. It includes two grain crops: pearl millet (Pennisetum glaucum) for sandy soils and grain sorghum (Sorghum bicolor) for heavier soils. (Corn is grown in high rainfall regions.) Two pulses are also produced: cowpea (Vigna unguiculata) and groundnuts (Arachis hypogaea). In the Sudano Sahel, an agro-pastoral system is practiced. The relative importance of the livestock component increases as we advance to regions of lower rainfall. Animal feed production is a very important component of the production system. It is provided by the hay produced from cowpeas and groundnut stems, and by sorghum and millet straw. In recent years, the farmers of northern Nigeria and the Tahoua region of Niger have discovered and unleashed the potential of a long-duration variety of lablab (Lablab purpureus) as a crop for the semiarid regions of the Sudano Sahel. Lablab (also known as the hyacinth bean in English-speaking countries and dolich in French-speaking countries) is an African species. Its wild relatives can be found in the arid regions of Namibia and other southern and eastern African countries. Lablab is much better known in wet tropical regions than in dry regions like the Sahel, even though it is considered to be a drought tolerant species. Some claim that it is even more drought tolerant than cowpea. Lablab is tolerant to a wide range of soil pH, ranging from 4.5 to 7.5. It can grow in sandy soils and in fine-textured, well drained soils. Lablab responds to improved soil fertility (using manure or fertilizers), but in most cases farmers do not use manure or fertilizers on lablab. The deep and prolific root system of lablab (in both sandy and clay soils) gives it a major advantage in the semi-arid tropics. The roots can exploit soil moisture to a depth of 2.0 meters and allow lablab to complete a full life cycle without irrigation. 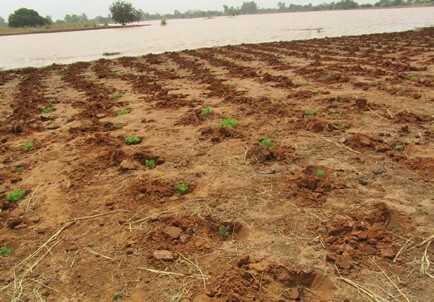 Farmers of the Tahoua region in Niger exploit this trait by sowing lablab in the wet soil of retreating temporary lakes. Temporary lakes are very common in the Sahelian region in places where silt and clay soils dominate. The area of these lakes ranges from a few hectares to hundreds of hectares. After the rains, the water of the lakes starts to evaporate and the lakes retreat. By the end of the dry season the lakes have completely or almost completely dried up. Farmers in Tahoua start sowing lablab in the beds of the lakes as soon as the water starts retreating (see Figure 1). Planting pits 10 cm to 15 cm deep are dug in the soil at 50 cm x 50 cm spacing. Three seeds are immediately planted in the moist soil of each hole. When seedlings emerge, they are thinned out leaving one or two plants per hole. When planted at this density, 8 kg of seeds will be needed per hectare. Initially lablab grows slowly (Figure 2), but at some stage it starts to spread, sending long runners that eventually cover the whole field (Figure 3). 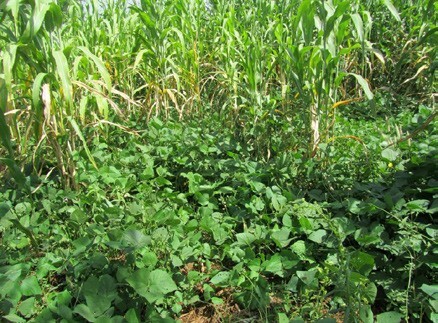 In the north of Nigeria and Tahoua-Niger, lablab is mostly used as a dual purpose crop for grain and for forage. Figure 2. Lablab two months after planting, ready to start spreading. Notice retreating water in the background. Figure 3. Lablab, three months after sowing, showing full field cover and beginning of flowering. Reported grain yields range from 500 to 2,000 kg/ha while forage dry matter yield ranges from 1 to 5 tonnes/ha (1,000 to 5,000 kg/ha) depending on variety and growing conditions. For comparison, the average grain yield of cowpeas in the Sudano Sahel is 500 kg/ha and forage dry matter yield ranges from 600 to 1,000 kg/ ha. The protein content of lablab seeds is around 28%. Crude protein content of lablab dry leaves is also 28%, and that of stems is about 11%. Lablab leaves can be cooked and used as a leafy vegetable. Green lablab pods can also be used as a vegetable. As a matter of fact, in Bangladesh and in India, lablab is mostly used as a vegetable, and special varieties have been developed for this purpose. It is the “ultimate food security crop.” Other staple crops are sown at the beginning of the rainy season, and their yields depend on both the distribution of rain and the quantity of rain. Lablab, however, is planted in water saturated soils and its yield is therefore almost “guaranteed.” You know at the time of planting that you will get a yield. In most cases, you also know about what yield might be expected. Lablab fixes atmospheric nitrogen. Even though groundnuts are leguminous, they do not add nitrogen to the soil. For cowpea, nitrogen fixation depends on varieties; many varieties fix very little atmospheric nitrogen. Lablab fixes atmospheric nitrogen at a rate of 15 to 40 kg per 1,000 kg of dry matter. Thus a 5.0 tonne/ha yield will add about 150 kg of nitrogen to the soil. Lablab’s prolific root system remains in the soil after harvest and enriches the soil with organic carbon. Lablab has few pests and diseases. Most field crops suffer from pests and diseases that significantly reduce yields. For example, if one does not spray cowpeas (and most Sahelian farmers do not spray) the grain yield is only 10% of what it could potentially be. Lablab, on the other hand, has few pests and diseases so there is no need to spray. If lablab is sown in the October to January period (gradually, as the lake water recedes), it will give a heavy forage yield from February to May. This is a period during which most pastures and crop residues have been exhausted, and livestock start losing weight. Fresh or dry fodder at this time of the year is very important for the performance of livestock. In many Sahelian towns and cities, people keep livestock (particularly sheep and goats) in their backyards. The supply of relatively good quality lablab forage to city livestock owners towards the end of the dry season is a very important economic activity, both for the forage producers and the animal owners (Figure 4). Figure 4. 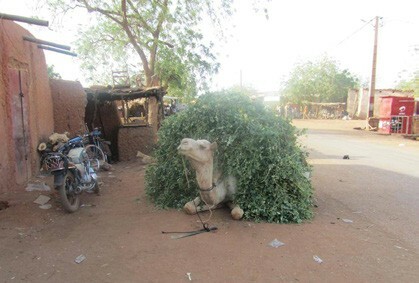 Camel bringing fresh lablab forage to a Niger town in the middle of May. In rice fields. In the Sudano Sahel, irrigated and rain-fed rice are mostly produced during the rainy season. In both cases, lablab can be planted immediately after the rice is harvested. In irrigated fields, if the top soil is not saturated, consider irrigating before planting lablab. Intercropped with maize and sorghum. Lablab is planted in places where soil moisture is sufficient for both the main crop and the intercrop. 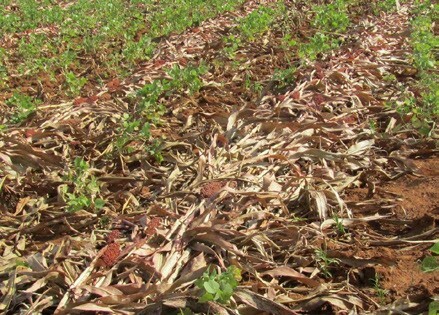 In maize and sorghum fields, lablab can be sown two weeks after the main crop is sown (to prevent competition from the lablab; see Figure 5). After the grain crop is harvested, the lablab will start spreading and will produce a grain and forage yield. Lablab can also be planted in the grain field a few weeks before harvesting, but only if the farmers realize that there is enough moisture left in the soil for the lablab crop after the main crop is harvested (Figure 6). Figure 5. Lablab planted in a sorghum field two weeks after sowing the sorghum. The two most common lablab varieties are Rongai and Highworth. Rongai is a late flowering variety (90 days) and Highworth flowers about 50 days after sowing. Both varieties originated in Kenya. They are widely used in Australia and elsewhere, mainly for forage. Lablab varieties display wide genetic variability as regards time to flowering. In Nigeria, some genotypes have been identified that flower about 40 days from sowing, and others that flower a full 150 days from sowing. A large amount of genetic variability also exists in relation to seeds’ color and size. The preferred color is white, but many varieties have colored seeds. Rongai: An excellent forage and ground cover. Does well in humid regions but is fairly drought resistant as well. Highworth: Matures quickly and yields well; pods are non-shattering. White: White seed. Vines can be used for forage and seeds are edible for human consumption. Chiang Dao: From Thailand; a drought-resistant green manure cover crop that is usually relay cropped with maize. Mature seeds are sold and processed as a snack food. Mix: ECHO also has a seed packet containing a mix of the White, Rongai and Highworth varieties. Since lablab has been an underutilized crop, to date there has been very little interest by the scientific establishment in the genetic improvement of this crop. If and when lablab starts spreading in the semi-arid regions of Africa, research institutes will start developing varieties that are suitable for each ecological condition and that can tolerate pests and diseases that are likely to spread with the intensification of lablab production. Dark-seeded varieties of lablab have high levels of both a cyanogenic glycoside and a trypsin inhibitor. Both of these compounds appear at lower levels in the light-colored lablab seeds. For this reason, lablab seed consumers boil the lablab seeds for about one hour, discard the water and boil the seeds again. Lablab seeds are rich in protein (about 26-28%) and are tasty. In Bangladesh and India, both the green pods and the leaves are consumed. 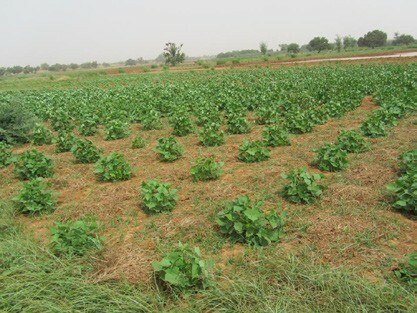 The rural population of the Tahoua region of Niger consumes fairly large quantities of cooked lablab leaves, which they prefer over cooked cowpea leaves. In this region, where the annual rainfall is 300 to 400 mm, lablab is already more important than cowpea for the region’s economy. 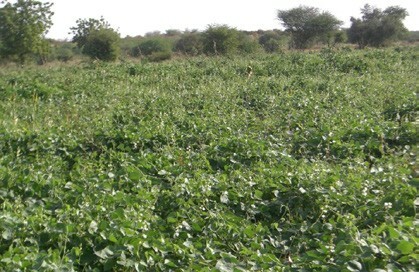 Fresh lablab leaves are one of the few green vegetables available in the Sahel during the dry season. They can play a very important role in both rural and urban nutrition. Practically all the literature on lablab is for the tropical regions. I could not find any reference of lablab production in the Sahel. But the biggest potential for lablab proliferation is in the Sahel and the Sudano Sahelian regions! These regions have very few staple and forage crop alternatives. The many attributes of lablab described in this article make this outstanding plant a potential new staple crop for the Sahel and the Sudano Sahel. The short duration varieties that flower 40 days from sowing are particularly interesting as rainfed crops that might take the place of cowpea as a main food and feed crop for the rainy season. As in the case of Farmer Managed Natural Regeneration (FMNR; see ECHO Technical Note #65, updated in 2012) the proliferation of lablab in the Sudano Sahel will be carried out by NGOs and other similar organizations and by farmer-to-farmer interaction. An NGO called CLUSA (Cooperative League of the USA) has already started disseminating lablab in East Senegal with great success. The potential of lablab is compelling. In my opinion, the mass introduction of lablab to the Sudano Sahel is a challenge and an obligation for all who care about food security and poverty alleviation in dry Africa.